Public transit accidents are rare and when they do happen, they are often out of the passengers’ control. However, following safety guidelines outlined by the transportation provider does reduce the likelihood of an accident and keeps you and your fellow rides safe from injury while in transit. The St. Catharines Transit Commission recommends following these riding tips when using the transit system. For your own comfort and safety, please remain seated until the bus comes to a complete stop. If you are travelling on St Catharines Transit and the bus is approaching kindly give a wave with your hand to alert the driver that you want the bus. If the bus approaching is not your bus simply step backwards to indicate that you do not need that bus. Running for a bus is dangerous and can lead to an accident. If the bus is already moving away from the stop, don’t chase it or try to get the Transit Operator’s attention. 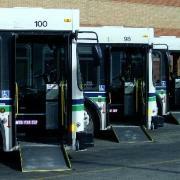 For everyone’s safety, Transit Operators are not encouraged to board passengers once the bus has left the stop. Please be at the stop at least five minutes early. When traveling on our public transit bus with a child and stroller there are some safety rules you should know. Please make sure you get a stroller that can be accommodated on St. Catharines Transit buses. SIZE OF THE STROLLER DOES MATTER. We recommend the size should be no more than (50.8 cm wide and 122 cm long) or (20 inches wide and 48 inches long). Larger strollers than specified may have difficulty maneuvering on and off the bus. It is recommended to travel outside peak periods. Brakes must be applied and St. Catharines Transit recommends the child be removed from the stroller. For the safety of all passengers the stroller MUST NOT block the aisles. The PRIORITY SEATING SEATS that fold up are for WHEELCHAIRS, SCOOTERS, and STROLLERS. Strollers must give priority to a wheelchair or scooter. No skis, toboggans or bikes are permitted on the buses. Hockey equipment is allowed, provided it is kept clear of the aisles. Roller blades/in line skates cannot be worn on the bus. All parcels, knapsacks and other bulky items must be kept clear of the aisle and off the seats. No pets (unless in small pet carrier) are permitted on the buses. Certified specialty dogs are permitted on the bus at all times. No food or drink is permitted on the buses. Smoking is prohibited on all buses, bus stop shelters and at the downtown terminal in accordance with City by-laws, Niagara Regional by-laws and Provincial Legislation. This smoking ban also includes the use of electronic cigarettes. For your own safety, please take the first available seats when you board the bus. Courtesy seats are at the front of all buses for the elderly or individuals with disabilities. Please help us to keep the seats clean. Allowing children to stand on the seats not only makes them dirty, but is also very unsafe. Any articles that you bring with you on the bus, must be taken with you, ie: newspapers, wrappers, tissues, umbrellas, etc. When a bus is full of passengers it is important for everyone’s safety that passengers do not stand ahead of the yellow line. This will allow the Transit Operator to have a clear view of their surroundings. If you have been injured in a transit accident, contact us.